FiLMiC Pro v6 is the most advanced video camera for mobile. Ever. 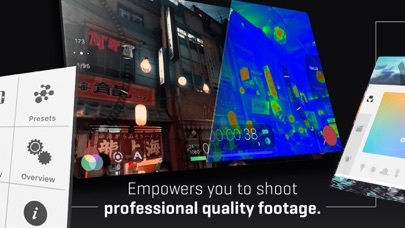 FiLMiC Pro has been enhanced with cutting-edge capabilities and the most responsive manual camera interface available on an iPhone, iPod or iPad. A multi-time iOS Video Camera App of the Year, FiLMiC Pro has been used in more high profile video projects than any other video app. Accolades to Date: Best Video Camera App - Best App Ever Awards Best Video Camera App - TUAW, Editors Pick Best App Ever finalist - Tap! Magazine Gizmodo Essential App 5 Stars, Editors Review, cnet.com App of the Week: Time.com/Techland Editors Choice - Wired, Film Riot, Macworld v6 continues this tradition by providing filmmakers, newscasters, teachers, vloggers, artists and musicians with the capability to shoot in a LOG gamma curve. LOG allows for greater tonal range and flexibility in post production setting the iPhone’s capabilities on par with camera equipment costing thousands more. † v6 Banner Features: •Dual arc slider controls for adjusting focus and exposure. •Live analytics suite including Zebra Stripes, Clipping, False Color and Focus Peaking. (A8 processor devices and newer) • Ramped zoom rocker control. • Waveform monitor including in tri-mode histogram. • White balance adjustment matrix with predefined and custom presets. • Content Management System for project file naming. • FiLMiC Sync integration to store preset data in the cloud and share between devices. • Clip favoriting. • Batch upload to supported share targets. • Gamma curve controls for Natural, Dynamic, Flat and LOG. † • Live shadow and highlight adjustments. † • Live RGB, saturation and vibrance adjustments. † († Available as an optional purchase for iPhones with an A9 or newer processor and iPads with an A10X or newer processor. Limited to 30fps at 4k) Foundation Features: • Standard, manual and hybrid shooting modes. A shooting style for any skill level. • Apple Watch support for remote start/stop and live video preview. • Portrait (vertical) and landscape shooting orientations. • Variable speed zoom. • Sync audio frame rates of 24, 25, 30, 48* 50* and 60* fps. (* iPhone 6 and 6s series only). • High speed frame rates of 60,120,240 fps (hardware dependent). • Slow and fast motion FX options. • Configurable time lapse Recording. • Tri-mode histogram, including waveform monitor. (A7 processor devices and newer) • Adjust video settings after capture (Exposure, contrast, saturation, tint, color temperature). • Downsampling to multiple size/resolutions. • Customizable saved personal presets. • Aspect ratio framing guide overlays. • Thirds guide for dynamic composition. • Image stabilization. 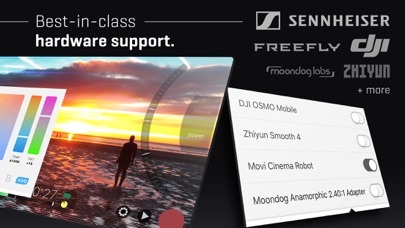 • Support for FiLMiC Remote. FiLMiC Remote allows you to control an iOS device running FiLMiC Pro with a second device running FiLMiC Remote. Full manual controls with pull capabilities for: Exposure-ISO-Shutter Speed-Focus-Zoom Up to a dozen different resolutions and aspect ratios including: • HD Widescreen (16:9) • Cinerama (2.59:1) • Super 35 (2.39:1) • Letterbox (2.20:1) • Digital Cinema Initiative (17:9) • Standard Definition (4:3) • Ultra Panavision (2.76:1) • Square (1:1) Share your video through any iOS share-capable apps like: Facebook, DropBox, Vimeo, SanDisk iXpand, FTP 4 Flexible encoding options to balance between quality and file size: • FiLMiC Extreme (offers 50mbps encoding at 1080p) • FiLMiC Quality • Apple Standard • Economy 3rd Party Hardware Support: • Moondog Labs Anamorphic Adapter (2.40:1) • 35mm lens adapters • DJI OSMO Mobile gimbal • Zhiyun Smooth 4 gimbal Advanced Audio Features: • Multiple audio formats - AAC, AIFF or PCM • Auto-sensing audio sampling • Auto-sensing headphone monitoring • Dynamic audio meter • Adjustable audio gain • Stereo recording support • Support for external microphone levels • Variable microphone positions ***Not all features available on older devices. Can we add the date and time to videos like a camcorder does? Been using Filmic Pro for a few years now and love the ability to customize my shots (frame rate, resolution, audio inputs). The last couple releases have fixed a lot of bugs and I see the app performing better and better each time (I.e. my phone doesn't get as hot as it used to). The cine kit is also totally worth it, def worth the in-app purchase! So excited! I had been using my Movi with the app and the footage is amazing but was so annoying to have to tap the screen. The new Movi capability gives me everything I need from the Movi’s buttons. Just awesome! . App freezes in the middle of recording. Been a problem for over 2 months with no fix. Ruining footage and I have been forced to just not use an app I paid good money for. I purchased the pro and remote. App is getting sticker and isn’t working right. When informed Apple, they refused to give me resolution and refused to refund me. This is a highly featured camera app and combined with the remote app I am able to use my ios devices for my youtube work. However ever since I got it there has been a problem with the camera freezing mid shoot while audio carries on. There has been no fix. It's a real bummer and a huge blemish for what's otherwise a great system. I use filmic for all of my serious filmmaking. Couldn’t you make a decent app for the watch as there’s one for the default camera app?! Pretty on point app. Didn’t expect it to be so on point.